We want to thank you all for showing us such great love and support throughout our lives! Thanks for visiting our wedding website and our Hilton Honeymoon Registry and making this all possible! We love you! The waters off Barbados boast some of the world’s most beautiful coral reefs, and Hilton Barbados Hotel provides us with an up-close experience of these natural underwater habitats in person! We’ll swim with the vast wildlife and take in the gorgeous surroundings. This excursion encompasses the excitement of Barbados! We will take a boat cruise to Brown’s Beach in Carlisle Bay and swim with the Green & Hawksbill Sea Turtles. After, we will explore the treasures of the depths on a thrilling SCUBA dive, or enjoy a fun-filled day with some of the exciting water-sports activities at Barbados Blue, including sea kayaking, snorkeling and jet skiing! Hilton Barbados Hotel is located right in the middle of some of the Caribbean’s best scuba dive sites, including the historic Carlisle Bay Marine Park which features six fascinating ship-wrecks and tens of thousands of colorful reef fish and turtles. We will have the time of our lives swimming with sea creatures and exploring the depths of the Caribbean! With spectacular views of Bridgetown and the picturesque Carlisle Bay, our Bay View Room is ideal for our honeymoon. Tastefully decorated in vibrant tropical colors, with deep rich woven furnishings and walls adorned with native Bajan arts, we will rest in our king size bed and take in the view of the bay on our private furnished balcony and through the floor-to-ceiling windows. We will have online access or can curl up with our favorite books or magazines in the easy chair. We will refresh and rejuvenate in the bathroom, designed with separate tub and walk-in shower and Peter Thomas Roth amenities. How luxurious! We may never want to leave with a stay in the Ocean View Room! Decorated in bright, vibrant colors, our room is spacious and accommodating, with a gorgeous view of the Caribbean from our balcony, a king size bed, air conditioning, and mini bar. Our bathroom features a separate tub and walk-in shower. Our attractive corner suite features two spacious balconies and floor-to-ceiling windows, and boasts an expansive master bedroom, a fully furnished living area with sofa and wet bar, and a separate bathroom with walk-in shower. We will enjoy Executive Lounge access with complimentary continental breakfasts, hors d'oeuvres in the evening and access to the Honor Bar. This richly furnished accommodation is decked out in a distinctive colonial style with traditional Bajan colors and locally commissioned Caribbean art. We will start the day in style with breathtaking sea views from the spacious balcony, then relax in the state-of-the-art Jacuzzi bathtub or simply retire to our luxurious Hilton Bed after a day spent exploring the fabulous Hilton Barbados resort. 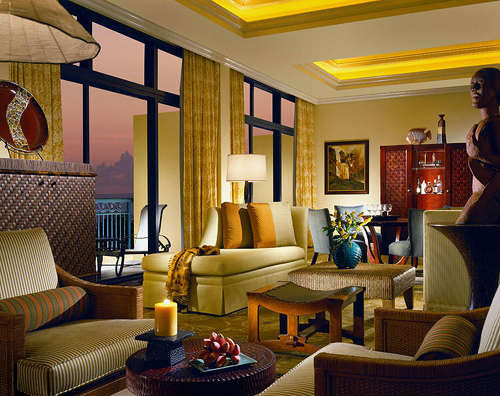 Our Executive Room at the Hilton Barbados hotel will be simply divine! 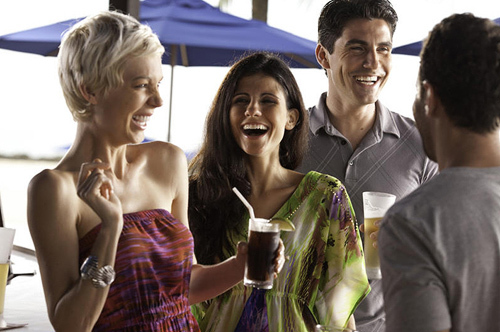 We’ll enjoy Executive Lounge access with complimentary continental breakfast, evening hors d'oeuvres and an Honor Bar. 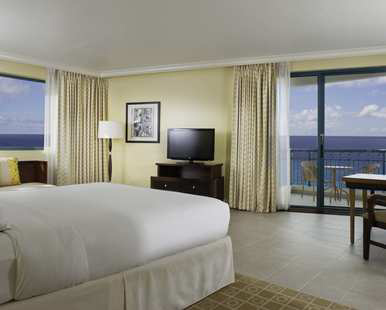 Located on the upper floors of the Hilton Barbados hotel, our Executive Room offers magnificent views of the Caribbean Sea and stunning Barbados coastline. The room features high-speed Internet access, floor-to-ceiling windows and private, and a furnished balcony with breathtaking panoramic views of the Caribbean’s turquoise waters. We will refresh and rejuvenate in the luxurious bathroom, which is designed with separate tub and walk-in shower and features luxury bathroom amenities. Together, we will dine in style at the Hilton Barbados Hotel’s premier resort restaurant. The Grille’s lavish and uniquely designed interior provides the setting for a truly memorable dining experience. The finest Certified Angus Beef Steaks - including succulent Petit Filets and thick Ribeyes - are carefully cooked to perfection in front of our eyes on the in-room grill, and are served with a choice of mouth-watering sides. Alongside the sumptuous signature steaks is an array of locally caught, market-fresh seafood straight from the ocean, such as the Caribbean Lobster Tail Salad starter and the always-innovative Catch of the Day specialties. Situated on the lobby level of the Hilton Barbados Hotel, The Lighthouse Terrace restaurant is open for breakfast, lunch and dinner daily, offering our choice of alfresco or air-conditioned indoor dining. The Lighthouse Terrace will allow us to enjoy our choices of International and local foods and beverages from the buffet or the a la carte menu. This is a perfect setting to start our relaxing day or escape from the sun for a refreshing lunch. 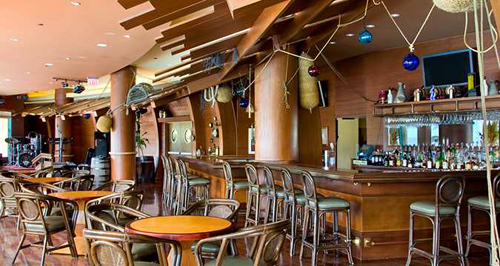 The Careenage Bar, uniquely styled as the hull of a keeled boat, provides a vibrant ambiance in which to socialize and soak up the leisurely Caribbean vibe. We will enjoy a heady cocktail made from the finest Bajan and Caribbean Rum, or sample light-bites and snacks from the exquisite Caribbean 'Tapas' menus. At the Water’s Edge Bar, we will sip sublime rum cocktails on our poolside loungers or dine on delectable light-bites, while enjoying azure ocean views. We can step straight from the pristine sands into this informal poolside bar, which is open daily for drinks, lunch and snacks at the Hilton Barbados Hotel. What a beautiful way to toast to our new lives together! Our honeymoon at Hilton Barbados Hotel will be enhanced with a romantic dinner for two on the beach. In a secluded setting on a private beach, we will indulge in a tantalizing 3-course dinner with a glass of wine. As the waves gently crash onto shore, we will admire the twinkling stars above while creating unforgettable memories drenched in intimacy and tropical elegance. With your generous contribution, our honeymoon at the Hilton Barbados Hotel will be unforgettable! Idyllically located on a 17th century fort, five minutes from the capital of Bridgetown, the resort features a sprawling pool complex with whirlpool, as well as three premium tennis courts and a Fitness & Health Centre with spa treatment rooms overlooking Carlisle Bay. 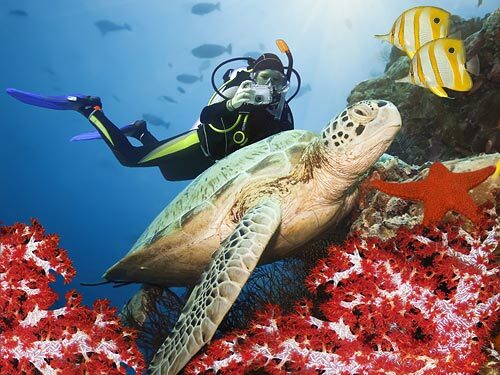 We will scuba dive off the beautiful tropical coastline snorkel with the vast marine wildlife. After, we will indulge ourselves in one of the hotel’s delicious restaurants and unwind in our luxurious guest room. 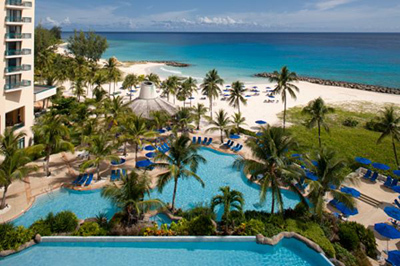 Our trip to Hilton Barbados Hotel will be the ultimate in relaxation! 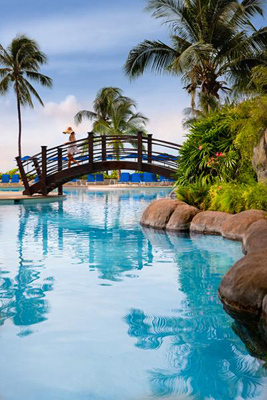 The gorgeous Hilton Barbados Hotel is the perfect destination for our honeymoon! The resort boasts activities such as scuba diving, snorkeling, and tennis, along with a relaxing spa and pool complex. We’ll lie on the beach, soak up the sun and drink delicious beverages, celebrating the beginning of our new lives together. Your thoughtful gift will help us create memories we will always cherish! A chilled bottle of sparkling wine will be delivered to our suite. We will make a toast to our romantic honeymoon in paradise while taking in the sweeping views of the sparkling Caribbean Sea from our balcony or terrace. How romantic! With your lovely wedding gift I will take delight in a relaxing Swedish Massage. Using European massage techniques, this lavish spa experience will soothe my mind, body and spirit, leaving me in a tranquil state of bliss. Hilton Barbados Hotel promises me an unforgettable spa experience with the Deep Tissue Massage. In the serenity of the spa, I will receive massage strokes that will release tension in muscles and smooth away stress. This tantalizing massage will help quiet my mind, body and spirit. My honeymoon at Hilton Barbados Hotel allows me to indulge in a lavish Hot Stone Massage. The warmth from the heated stones will penetrate deep into my muscles while soothing massage techniques will transport me into a world of peace and calm. This massage will leave me in heaven. The calming scents of lavender and chamomile will help me unwind, and the even strokes from the massage will relax my muscles. This sweet treatment is definitely one of a kind! My body will be exfoliated with chocolate, which provides my skin with essential nutrients that I need. My skin will be left soft and smooth, and the magnesium from the chocolate will relax any tension out of my muscles. The natural oils along with the sweet smell of the brown sugar are bound to leave my skin heavenly after this treatment. The brown sugar scrubs away dead skin cells and gives me youthful skin! This is a super hydrating treatment that will saturate my skin with moisture helping diminish fine lines. I will be left with a plump, dewy complexion. How divine! The deep-cleansing facial will stimulate the circulation beneath my pores and exfoliate dead skin cells, leaving my face softer, smoother and rejuvenated! After a long day in the sun, this wrap is exactly what my body will crave! The soothing botanicals of the wrap will cool down my skin and protect it from peeling, ultimately giving me sun-kissed skin! This is the perfect pick-me-up for those times when a quick getaway is just what I need! 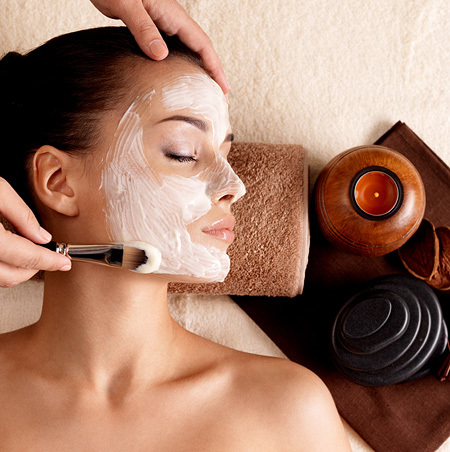 This spa package includes a 30-minute Relaxing Facial and a 30-minute Signature Massage, customized especially for me. We will enjoy the simplicity and the soothing sounds of the Caribbean Sea! Together, we will indulge at the historic Charles Fort with a variety of services from one of the hotel’s trained therapists. We may choose a Relaxing, Therapeutic, Swedish or Aromatherapy Massage. This massage is perfect for our honeymoon! We will unwind and relax, side by side, each with our own personal therapist in the same private environment. After, we will enjoy warm stone placement and an exhilarating foot massage. Invigorating yet soothing, this treatment is the ultimate in self-indulgence! We will celebrate the greatest day of our lives at Hilton Barbados Hotel on the beautiful island paradise of Barbados! With your generous wedding gift, we will experience a wedding ceremony on a private beach while our family and friends gather to witness our beloved day. Our on-site wedding coordinator will take care of every single detail for our big day from our ceremony to the reception and all guest arrangements. Whether we are planning an elegant event or an intimate wedding, Hilton Barbados Hotel will ensure that our day is pure perfection!